LIBERAL, Kan. – The Seward County baseball team (5-2) split the first two games of a four-game series against the Northeastern Plainsmen (1-1) Thursday at Brent Gould Field. The Saints won the first game 9-0 before dropping the second 10-9. Freshman Braeden Gould (1-0) got his first start on the mound, picking up the win in 3.0 innings pitched, giving up one hit and striking out five along the way. Blake Hale and Brooks Williams combined for the other four shutout innings, striking out seven and giving up three hits. The Saints got on the board early with a home run from Cayde Ward in the bottom of the 1st inning. Following a Spencer Sackett walk, Ward swung at one pitch before taking the next over the center field wall for the two-out two-run bomb. Seward kept rolling in the second inning. Following a lead off single and a walk by Jacob Nielsen and Ben Tsui, Jose Caraballo doubled on a line drive to left field to bring home the two baserunners, making the score 4-0. Brenden Madsen followed Caraballo with a double of his own, scoring another run for the Saints. A sacrifice fly by Spencer Sackett brought Madsen home two batters later, to make the score 6-0. The scoring had to wait until the bottom of the fourth. Madsen reached on a lead off double. Two straight ground outs appeared to put the Saints in a bad spot, but a Ward double to left field brought Madsen across home plate to make the score 7-0. In the bottom of the fifth, Cole Bergdall led off with a single to left field. A wild pitch on the next pitch pushed Bergdall to third base. Nielsen grounded out to bring Bergdall home. The final points came in the bottom of the sixth when Ward drove home Madsen on a sacrifice fly to center field to make the score 9-0. Madsen, Ward, Bergdall and Nielsen all recorded multi-hit games. Ward led the Saints with 4 RBI on 2-of-4 batting. The Saints came away with 10 hits as a team. West Reddell took the mound in game two, earning a no-decision after giving up five runs over four innings. Brayden Conner (0-1) and Jordan Pepper came in as relief. Conner took the loss, giving up five runs off five hits in 1.2 innings pitched. Following a scoreless first inning, the Plainsmen exploded for a four-run second inning. With two outs, Carter Allen hit a double to right field to score the first run. Kodee Martin stepped up to the plate next to drive home two more runs with a single to center field before Easton Adler drove home the final run with a ground ball single to center field. Not able to answer in the second inning, the Plainsmen extended their lead with a two-out home run to center field by Russell Strilchuk to make the score 5-0. Seward finally had an answer for Northeastern in the bottom of the third. Following an error and hit-by-pitch, Madsen hit a sacrifice fly to bring home the Saints firs score. Bergdall singled with the next at bat to bring home Jared Hasik. A Cody Coontz single to shortstop allowed the Saints to score their third run of the inning to make the score 5-3. The Saints used another big inning in the fourth to take the lead. A lead off home run off the left field foul post by Benny Ayala cut the deficit to just one point. A loaded-bases walk brought across the tying run before Cruz Shope single to left field to score two more runs, bringing the game to 7-5. The game appeared to be in hand, but a strong sixth inning by the Plainsmen was the deciding factor. A sacrifice fly to second base cut the lead to just one, before Quinn Tomasino hit a three run home run to take a 9-7 lead. Another home run with the next at bat gave Northeastern a 10-7 advantage. Madsen reached on an error by the first basemen to load the bases again, this time for Bergdall. A ground ball to shortstop ended the game on a double-play, with Northeastern winning, 10-9. 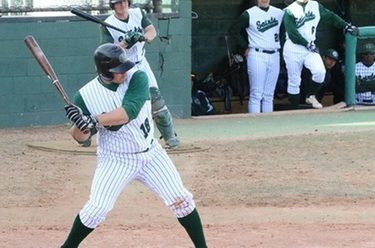 Cruz Shope and Cody Coontz were the lone Saints to get multiple hits in the second game with Shope finishing 2-for-4 and Coontz finishing 2-for-5. Shope also led the Saints with two RBI. The Saints will be back in action for another double-header against Northeastern tomorrow (Feb. 9) at 12:00 p.m. at Brent Gould Field in Liberal. The game will be live-streamed at SewardSaints.com.